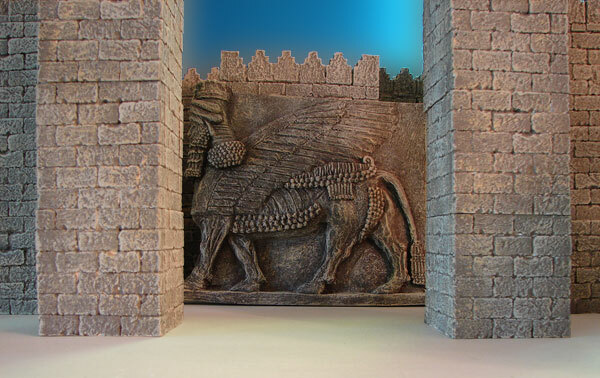 This miniature replica is a giant Winged Lamassu of Assyria, from the Palace of Sargon II. It was used at palace entrances and placed strategically by magicians to protect from evil. It was discovered at the site of ancient Khorsabad around 1843 by Paul Botta and dates to the reign of Sargon II (721-705 BC). The original is located at the Louvre Museum in France. It is over 16 feet tall and weighs over 40 tons. 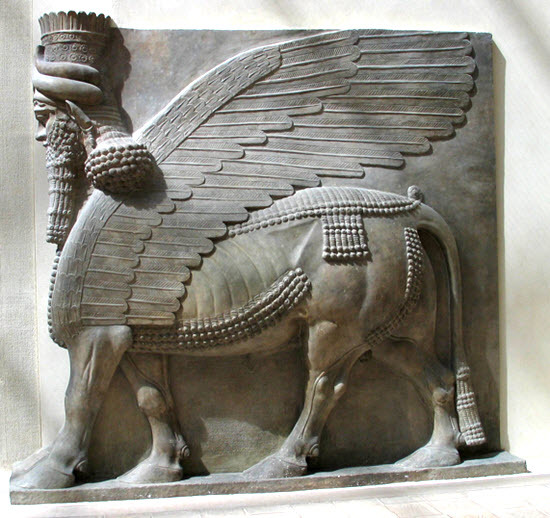 - The Lamassu was later reused in Persian Achaemenid royal gates. 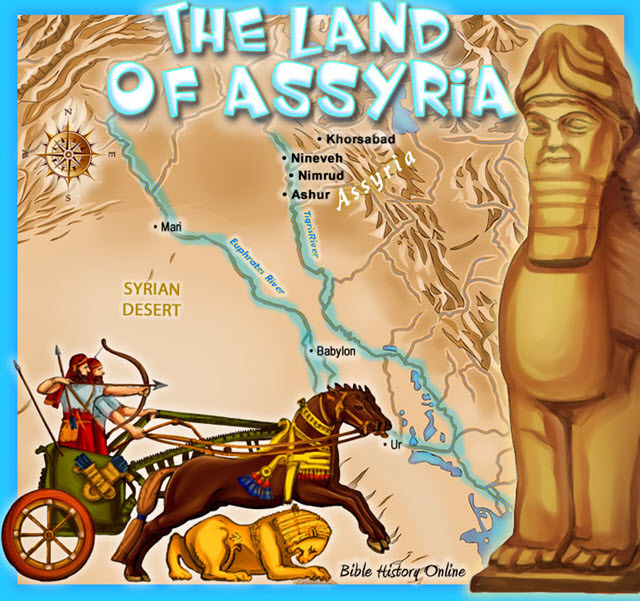 - King Esarhaddon said they were used to "repulse the wicked"
Interesting Note: An Assyrian scribe claimed that one of the reasons for the death of Sennacherib was that a Lamassu fell on him because of his impious deeds. Sennacherib was the Assyrian king who lost his army attacking Jerusalem, destroyed by the "Angel of the LORD." Carved from a single block, it stands more than 4 meters high by 4 meters wide and is a meter in depth. The head is sculpted in the round, the rest of the body in high relief. 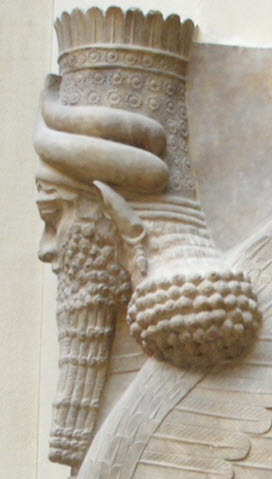 High relief was much prized in the time of Sargon II, when modeling became more marked. The head, the only human element, whose ears are those of a bull, has a man's bearded face with very precisely modeled features. The eyes are expressive, the thick eyebrows meet above a prominent nose. The kindly mouth is surmounted by a thin mustache. A curly beard covers the jaw and chin, while the hair falls down to the shoulders, framing the face. This human head wears a starred tiara, flanked by pairs of horns and topped by a row of feathers. The body, its anatomy very precisely rendered, is that of a bull: the beast has not four but five legs, so that it looks as if standing still when seen from the front, and as if walking when seen from the side. From the shoulders spring the wings of a bird of prey, only one being visible, curving above the back; broad panels of curls cover the breast, belly, back, and rump. The tail is very long and curly at the end. An inscription on two panels between the hind legs of the bull praises the ruler by rehearsing his virtues and calls down a curse on whomever should seek to harm the edifice. Wikipedia notes: A significant number of the items recovered by the French at Dur-Sharrukin were lost in two river shipping incidents. In 1853, Place attempted to move two 30-ton statues and other material to Paris from Khorsabad on a large boat and four rafts. All of the vessels except two of the rafts were scuttled by pirates. In 1855, Place and Jules Oppert attempted to transport the remaining finds from Dur-Sharrukin, as well as material from other sites being worked by the French, mainly Nimrud. Almost all of the collection, over 200 crates, was lost in the river. Surviving artifacts from this excavation were taken to the Louvre in Paris.